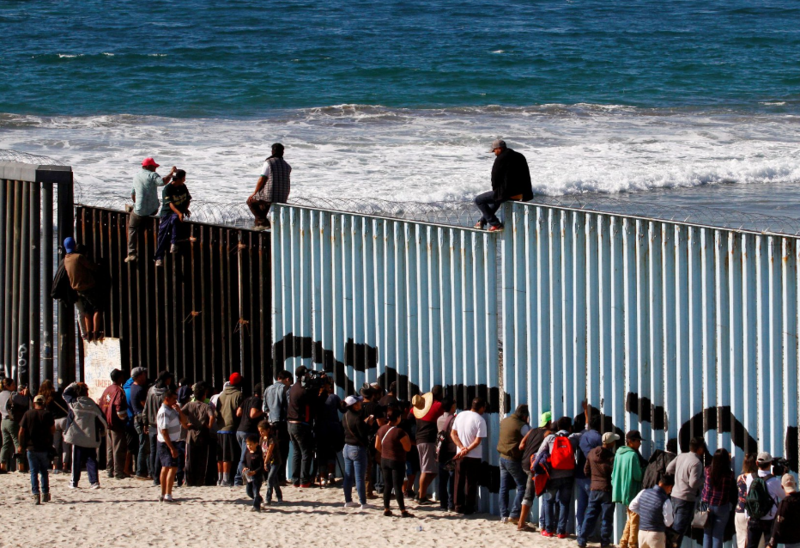 By now, more than 1,500 migrants who were part of one of the multiple migrant caravans (which has been traveling from Latin America to the United States for the past few weeks) arrived in the Mexican city Tijuana, on the border with San Diego. Part of the caravan decided during the trip not to continue on foot any longer, but instead to get on buses to the US. On Thursday morning, some 22 buses with about fifty migrants arrived in Tijuana. They joined the 800 migrants who have been seeping into the city in small groups ever since Sunday (see our related coverage). Related coverage: <a href="http://thegoldwater.com/news/42282-Caravan-Second-Migrant-Group-350-Arrives-Near-San-Diego-Climbs-Fence-Video"> Caravan - Second Migrant Group (350) Arrives Near San Diego, Climbs Fence (Video)</a>. When migrants began answering the violence, Mexican police had to intervene. Dozens of agents were called to restore order. The Central American migrants declared that they were amazed at the hostile reception in Tijuana. "We are not criminals. Why are they treating us like that here, while we were always well received in Mexico? " When the majority of the caravan (some 6,000 more are on the way in different caravans) will reach Tijuana it is not clear yet. On Tuesday already some 350 migrants with buses arrived in north-western Mexico, opposite the US city of San Diego, California. "I am happy and only a step away from a new life in the US," said José Alfredi Mejía Márquez from Honduras. He had joined a so-called migrant caravan a month ago in the Honduran city of San Pedro Sula. The migrants flee the violence of youth gangs and the poor economic situation in the region. Related coverage: <a href="https://thegoldwater.com/news/42108-Caravan-LGBTQ-Honduras-Migrant-Group-Arrives-In-Tijuana-Ready-To-Cross-Video">Caravan - LGBTQ Honduras Migrant Group Arrives In Tijuana, Ready To Cross (Video)</a>. However, most of the group is still located some 2,400 kilometers south of the Mexican city of Guadalajara. The caravan consists of about 5,000 people from Honduras, Guatemala, and El Salvador. Their ultimate goal is to apply for asylum in the United States. On the way over there, the caravan disintegrated into smaller groups and other Central American caravans started as well. The second group of migrants, consisting of 1,200 people, is still resting in a sports stadium in Mexico City. The third group of around 2,000 people was on their way to the north in the southern state of Veracruz. US President Donald Trump tightened asylum procedure legislation for those wanting to cross the southern border as of last week. The Republican President decreed that migrants who cross the border illegally with the US will not be able to file an asylum application. The procedure is therefore in principle only possible at official border crossings. The decision is highly controversial and several humanitarian organizations have already announced their opposition before the US courts. A dead mexican't is a good mexican't. Central americano trash should be shot between the eyes! ONLY GOOD BIGOT IS A DEAD BIGOT!!! They'd better stop it! What right do they have to just ignore all our President's orders??? We have enough blatant disregard of law with our own DemonRats!!! Why isn't there concertina wire on top of this wall?